Have you ever wondered what it would be like to ride the front of the caboose as a steam-powered freight train winds in front of you! Now you can! 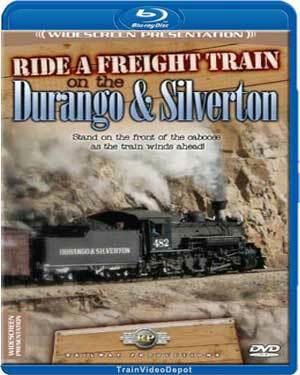 In "Ride a Freight Train on the Durango & Silverton", you're on-board caboose 0505 as a short freight travels from Hermosa to past Tank Creek! 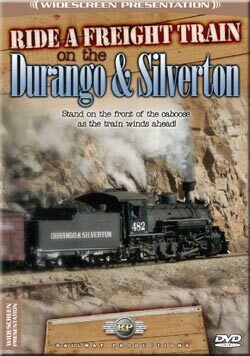 It's relaxing to watch the locomotive and train wind through the Colorado mountains and along the Animas River as the engine chugs along. A great steam program that you'll enjoy watching again and again! Widescreen. DVD features the ability to turn the narration on or off. Running time approx. 80 minutes. Steamboy (Revere MA US) on 2016-07-22 16:07:34. If You Can't Afford A trip to The railroad, How's about a chance to let the railroad come to you? Overall, this was the very first Widescreen DVD to Have Lane Venardos Narrating until 2011's Winter in the Blue Mountains. Would kids enjoy this? Definitely! Rail Buff (Southern California) on 2016-04-21 12:16:29. I've seen the previews of this numerous times and passed. Now, having finally bought it, I'm wondering why I waited so long. This is an EXCELLENT presentation and one of the best of the D&S. I have most, if not all, of the Blue Ray discs on the D&S and this one showed things none of the others did, nothing esoteric, just mundane things, e.g. a highway bridge over the RR I ever knew even existed. Just received an e-mail from Les Jarrett of Railway Productions. He said that the reason that the video stopped short of Silverton was because there was a "...big slide across the tracks north of Needleton". Unfortunate. Oh well. That's railroading.